Pair of Dual Premium 15" PA/DJ Speaker Cabinets with Titanium Horns - Wheel Kits and Rear Handles Model #: FL-155PC (Pair). 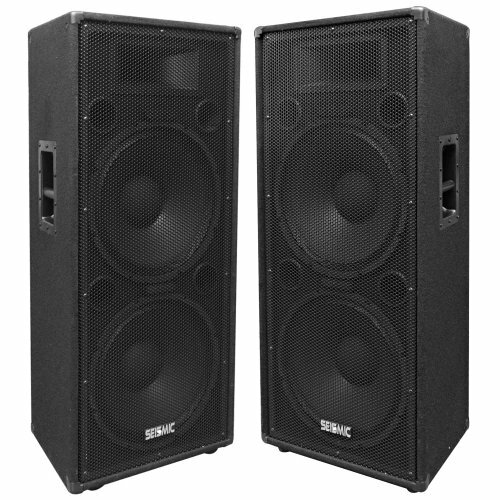 Pair of Dual 15 Inch PA/DJ Speaker Cabinets. Each Cabinet has a rear handle and wheel kit for easy mobility. 800 Watts RMS, 1600 Watts Peak. Woofers have an 80 oz magnet and 3" voice coils. 1.5" Titanium tweeter driver with 10 oz magnet and 1 3/8" throat. 5" x 10.5" Horn (Lens). Two 1/4" inputs and two Speakon inputs. Frequency Response: 50 Hz to 20k Hz. Crossover: 12/18 db per octave 3K Hz high power with dual glass bulb tweeter protection. Impedance: 4 ohms. Sensitivity: 100 db. 7 Ply Birch Plywood. 4 Ports. Acoustic Installation (Vibration Damping Material). Full Metal Grill. Steel Recessed Handles. Black carpeted covering. Black metal handles. HxWxD: 42.75" x 18.75" x 14.5". Weight: 66.8 pounds per cabinet. Brand New. One Year WarrantyOur Fault Line Series of speaker cabinets is our premium line made from solid birch plywood. The Fault Line series provides superior sound across all 3 ranges: high, mid, and low! These amazing dual 15" Pro Audio Speaker Cabinets deliver every sound loud and clear! These speakers are unparalleled in performance. We have now added features to make them more portable. We know how hard on the back it can be to carry Dual 15 inch speakers around. Therefore, we have added a rear handle and wheel kits to each one of these PA Speakers to make them as easy on the back as they are on the ears! Equipped with two pro audio 15 inch speakers, a 1 3/8" titanium compression driver, a frequency response of 50 Hz to 20k Hz, and 800 Watts RMS per cabinet these PA speakers will give you optimal sound!